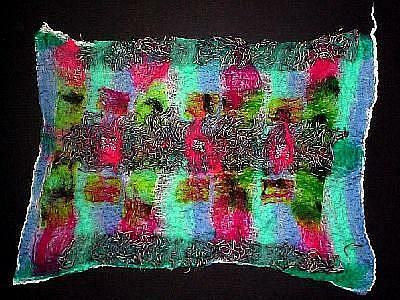 Fiberart is experiencing a new level of popularity and visibility in the art world. This week you'll see pieces that explore both the traditional and the cutting edge of the media and its possibilites, from the art quilt to sculptural and mixed media works. EBSQ is proud to offer these seven works in conjunction with the 2004 Fiberart International Biennial Exhibition of Contemporary Fiber Art, which opens 3 April 2004 in Pittsburgh. Nuno felt is a new thing for me and great fun. This is my third piece and is Merino Wool, Indigo dyed Hessian, pre-felt and silk on a cotton scrim base.